This gluten-free Cranberry Speculaas Granola with walnuts, hazelnuts, almonds, dried cranberry and speculaas spice is delicious this time of year. It is hearty and warming, just what you need on a cold morning. Breakfast is something I really look forward to. I create time for it, even if it’s very early in the morning. This Cranberry Speculaas Granola is inspired by the fall season. 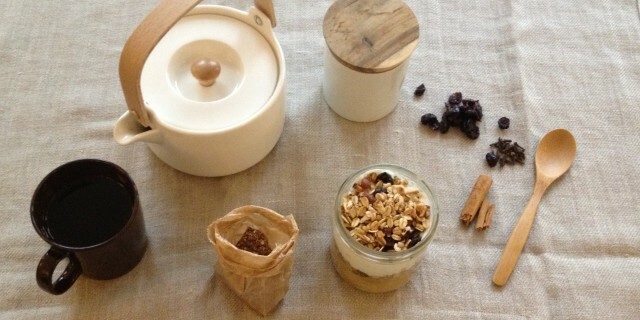 Making your own granola is great if you want to follow the seasons. You can add anything you like, from spices and dried fruits to nuts and seeds. I have used typically Dutch speculaas spices, which is quite similar to Pumpkin Spice mix. Speculaas spice mix typically consists of cinnamon, cardamom, aniseed, cloves and coriander. Some mixes also contain ginger. I love ginger, and, as my speculaas mix did contain any ginger, I have added it to my recipe. At home I serve my Cranberry Speculaas Granola with coconut yoghurt or warm almond milk and fresh apple slices on top. My absolute favourite way of eating it is parfait-style with still warm cinnamon baked apple slices on the bottom, the Cranberry Speculaas Granola as a second layer and finished off with a layer of thick yoghurt. I love coconut yoghurt but any of your favourite thick yoghurt will do. In a large saucepan on low heat up heat oil, coconut sugar and maple syrup. Add all ingredients, except for the dried apple, and stir well, until all ingredients are lightly coated. Take off heat and place mixture in a large baking tray. Spread out evenly. Roast in oven on 175 degrees celsius for 15-20 min, stirring every once in a while, to make sure the mixture is evenly roasted. When ready, allow to cool down. Add dried apple. When cooled down, store in an air-tight glass container. Serve with a thick yoghurt like coconut yoghurt or warm almond milk. If you enjoy this recipe and like to get free updates on what’s cooking up in my kitchen, sign-up for my newsletter here.